Three litres of diesel power in a saloon car body – now that’s an idea that requires some reflecting on! The BMW 530d is magnificent. All the handling excellence and comfort levels that have kept the BMW 5 series at the top of its game for so many years is still apparent, only improved. This classy and deceptively quick machine has power and beauty rolled into the one top-notch handling package that provides the driver with an immensely satisfying drive. The occupants will only sit back and admire the levels of excellence that have been pooled into such a masterpiece. The BMW 530d, when gazed upon from the front, has a mean and purposeful look. A look that gives the impression that the driver of such a car is a person that has purpose to there life -someone that has a mission in life being fulfilled. If you saw a BMW 530d staring into your rear vision mirror while travelling a hilly piece of open road, the chances are that it would not be long before you would get a rapidly diminishing view of its decent rear end. Yes, this car is more than capable of producing such an event over and over. Even with a miserly 7.5 litres/100 km within reach of the everyday driver, one would be forgiven to think that performance might not be quite up there. This is far from the truth. The BMW 530d has 160 kW of power within the grasp of the driver at 4000 rpm. But get a load of this – a thumping 480 Nm of torque is on tap at just 1750 rpm! Now, can you get the picture of the passing manoeuvre mentioned earlier occurring frequently? The BMW 530d can accelerate from 0-100 km/h in around 7 seconds. A top speed of around 242 km/h is shatteringly fast for a diesel powered 5-seater saloon car that will be primarily driven by the businessman to work during the week and out for a weekend trip with the family on Saturday. Poise and balance on the open road is nothing short of excellent. The BMW 530d can be hustled through corners point to point rapidly while retaining fine balance and control. The engine is superbly flexible and the six speed semi automatic is silky smooth when engine revs force a gear change. The comfort levels inside the BMW 530d impress. A dual zone automatic air conditioning unit keeps the ambience in the cabin pleasant. There is also a rear central air outlet to aid rear seat passenger comfort. A nice warm cup of coffee or other beverage can be held within reach by the front cup holders. So that those sitting in the back do not miss out, a rear centre armrest with 2 cup holders and an inbuilt storage capacity serves the rear seat passengers well. Leg room in the back is good and the BMW 530d can hold 3 adults in the back adequately. The BMW 530d has sliding front arm rests to add to the already incredibly comfortable and impressive front seats. A long journey becomes a breeze in a machine like this. To make the possibility of car theft less likely, an engine immobiliser has been embedded into the security system and each BMW 530d comes with a remote control Thatcham category 1 alarm. 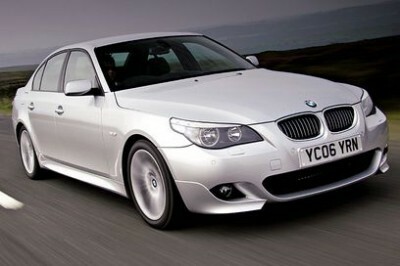 The BMW 530d is a breath of fresh air in car design and is a wonderfully tempting package -not to mention powerful. For any more information on the BMW 530d, or for that matter any other new car, contact one of our friendly consultants on 1300 303 181. If you’d like some fleet discount pricing (yes even for private buyers! ), we can submit vehicle quote requests out to our national network of BMW dealers and come back with pricing within 24 hours. Private Fleet – car buying made easy!